Probably doesn't warrant mentioning, but this is a compilation of pre-Nevermind Nirvana songs, released (from what I can tell) to tide fans over until their next proper record was finished. Worked for me. I'm fairly certain I had heard every track on Incesticide before it came out, aside from "Big Long Now," which had somehow not sneaked onto any of the tapes that were being passed around. Not trying to sound like a cool guy; I'm just saying. And the versions I had heard were ones that had been dubbed a jillion times, so I was ready to step things up. Between having CD-quality copies of all these songs and the sweet extensive liner notes by Cobain on the inside (that mentioned the No on 9 benefit show I saw them at! ), I could not have been more jazzed about this collection. I still think it's great. As usual, I wish they would have sequenced the songs in chronological order, but the recording dates for all the songs are all within the scope of a few years, so it's not that big of a deal. The one track that's conspicuously absent from this thing is "Spank Thru," which was, to the best of my recollection, the first Nirvana song. I always wished that track would have kicked this thing off. But, that's a minor complaint. For folks who had fallen in love with Bleach, this thing was a godsend. Most of the cuts were of that era, and a lot of them retained that scratchy, dirty quality that made that record so fantastic. There are a few covers here (three of the four from Hormoaning), but for the most part, this thing is filled with Nirvana originals, which is awesome. Casual fans didn't really care for this thing, but for those of us who were dying for something new from the group, this did the trick. And for me, I was crazy excited to even hear one song I hadn't heard before. I've never gotten the vibe that "Big Long Now" is a hugely popular Nirvana song, but I've always loved it. It's slow, slightly sludgy, and Cobain's vocals on it are incredible. I still put this record on every once in a while, and I have no trouble rocking it front to back. I still consider it a fairly odd release, and I think I was pretty surprised when it initially came out. There are no songs on here with any commercial potential (aside from maybe "Sliver"), and DGC didn't make much effort to push it. 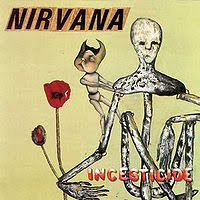 I think this was the first Nirvana album that I bought on CD, now that I think about it. I had the "Come As You Are" and "Lithium" singles on CD, but not either of their first two records. In fact, strangely enough, I have never owned a copy of Bleach or Nevermind on CD. Maybe that's not that strange. I bought an original LP copy of this record probably about ten years ago, along with an original copy of In Utero, at my favorite record store in Salem. Incesticide is on blue and white swirled vinyl and is awesome looking. Glad I bought it when I did, as they go for a good chunk of change now. Nothing outlandish, but they're becoming rarer and rarer. It's worth it. This is a real purdy record, and the songs are damn good as well. I remember feeling really cool when this CD came out because I had already heard most of the songs. I was excited to finally learn the songs' names (because I am a huge nerd). The fact that I had heard most of it didn't stop me from listening to it a gazillion times. "Hairspray Queen" is an insane song.